The report titled “Global Biopreservation Market: Size, Trends & Forecasts (2016-2020)”, provides an in-depth analysis of the global biopreservation market by value and by segments. The report provides an analysis of the biopreservation market by region: North America and Asia-Pacific. The report also assesses the key opportunities in the market and outlines the factors that are and will be driving the growth of the industry. 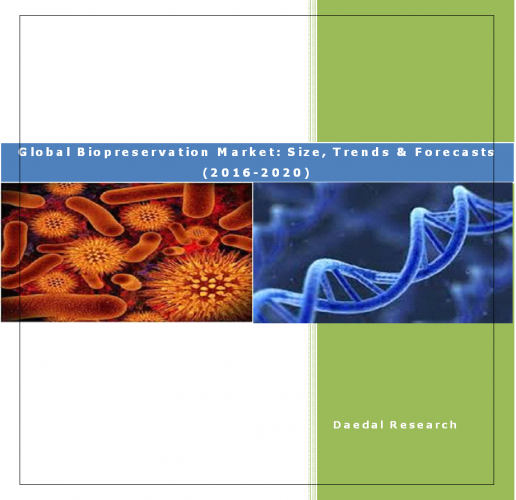 Growth of the overall global biopreservation market has also been forecasted for the period 2016-2020, taking into consideration the previous growth patterns, the growth drivers and the current and future trends. The competition in the global biopreservation market is fragmented with several players, such as Biolife Solutions, Inc., VWR International, QIAGEN, Panasonic Technologies, Biocision, Thermo Fisher Scientific, Inc etc. Further, the key players of the global biopreservation market:Biolife Solutions, Inc., VWR International, QIAGEN and Thermo Fisher Scientific, Inc. are profiled with their financial information and respective business strategies. Biopreservation is preserving the human biological samples also known as biospecimen in the cultured and stable environment for retaining the functionality of the samples intended to be used for various research purposes. Cells, tissues, plasma, urine, saliva, organs, and other body fluids are the type of samples that are preserved for a specific duration. The biopreservation market can be segmented on the basis of product type and on the basis of application. The biopreservation market by product type has the following sub segments: equipment market, media market and laboratory information management system (LIMS). The biopreservation market by application can be classified into: biobanking, regenerative medicine and drug discovery. Global biopreservation market has increased at a significant CAGR during the years 2011-2015 and the projections are made that the market would rise tremendously in the next four years i.e. 2016-2020. The growth of the global biopreservation market is expected due to increasing healthcare expenditure, increasing chronic diseases, rapidly mushrooming biorepositories and the increment in personalized medicines. Yet, the market faces some challenges such as risk in sample custody, management issues of biospecimens, need to develop the preservation methods and compromised biospecimen information. 7.3 Thermo Fisher Scientific Inc.